We’d love your help. Let us know what’s wrong with this preview of Rightsizing * a Smart Living 365 Guide to Reinventing Retirement by Kathy Gottberg. 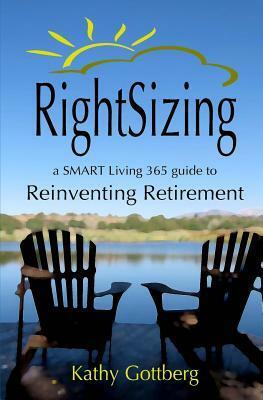 To ask other readers questions about Rightsizing * a Smart Living 365 Guide to Reinventing Retirement, please sign up. It is never too early, or too late, to put the ideas of this book into practice. Gottberg's thoughts on rightsizing are incredibly liberating. Far from a one-size fits all philosophy, the practice of rightsizing is unique to every individual reader. At its essence, this concept is a journey that keeps us focused on what is most important to us, and helps us to let go of what no longer serves. The freedom to leave false expectations behind, and live our lives unapologetically, is exciting and ins It is never too early, or too late, to put the ideas of this book into practice. Gottberg's thoughts on rightsizing are incredibly liberating. Far from a one-size fits all philosophy, the practice of rightsizing is unique to every individual reader. At its essence, this concept is a journey that keeps us focused on what is most important to us, and helps us to let go of what no longer serves. The freedom to leave false expectations behind, and live our lives unapologetically, is exciting and inspiring. This philosophy helps us to better manage our lives on all levels, not only financially.